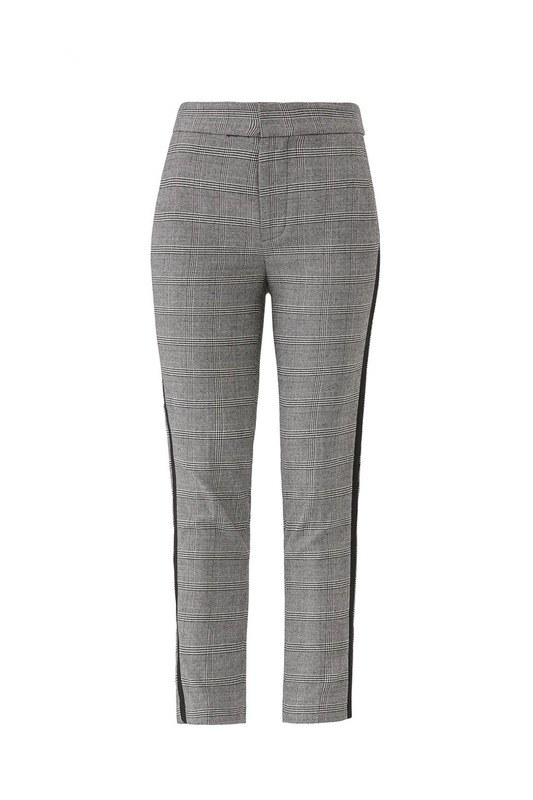 Contrast stripes from hip to hem give a nod to sporty styling on these tailored plaid trousers from Joie. Grey plaid crepe (63% Polyester, 36% Viscose, 1% Elastane). Pants. Hidden front fly zipper with hook-and-eye closure. Side pockets. 35.5" from waist to hemline; 26" Inseam. Imported. Great fit and length for shorties!! I'm 5'4" and these hit right above my ankle. Great fit, a teeny bit tight in the hips. I got so many compliments! Super comfy and looks great with heels and loafers. My only critiques are that 1) not stretchy at all, so bending down was difficult and 2) I had "the gap" in the waist--not meant for hourglass figures. Loved these pants! It felt like I was wearing PJs but they looked professional. I'm 5'3 and they were the perfect length, especially worn with heels. 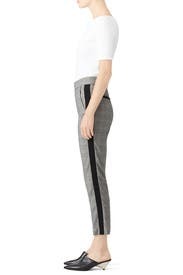 The stripe down the side was a nice touch that really helped these pants stand out from typical dress pants. Would definitely rent again or buy! I'm not sure if a size up would have been too baggy. They are comfortable. But I wore these twice, first time to networking party at an art gallery with this patterned shirt which my husband thought looked word but I liked it. Love love love these! I'm a bit short and these are the perfect crop. I could see these working in a professional environment and if you wanted to go out in them. I will say, if you've got a bigger booty & thighs and want a loose fit, go a size up! I'm between a 4 and 6, and the 6 was good. They were beginning to pill a little after a few wears. I loved renting but would not buy them. They were super cute tho! Everything about these pants was terrific! Ankle length trousers. Grosgrain ribbon on side gives them a nice finish for parties. Fabric is soft and not stiff so weren't form fitting but looked cute! Updated work pant. Love them! Fit is great. Love the stripe down the side. Fun to have something different for work. Could have been longer, But not surprising as im 5'11"
Warm, excellent fit, great staple for work wardrobe. I am usually a 2-4, but the 4 in these barely fit. Might have been cute otherwise. Got lots of compliments on these pants! As a petite woman I was afraid they would be too long but the length was great with my heels. Went with everything! I usually don't rent pants but these were so cute. I loved the print and strip on the side. Great! Runs a little big, probably could have gone with a 2. The knees are a bit baggy, probably because I'm so petite, great pant though! I found these pants super flattering, especially for a slightly more bodacious backside. They fit my waist to size and gave a tiny bit of stretch throughout the day. Also, the length was pretty cropped for my long legs, but I liked the look. The side detail added a more elevated look. Super comfy can wear with flats, heels or ever with boots with long socks! did not fit well for a curvy/petite figure given the seams on the side. Love these, but they were a little tight in the waist. The black stripe down the side gives these that little extra something. If they weren't too tight in the waist, I would have considered buying them. Super cute pants, just wish they were a tad longer a normal issue with crop cuts at my height. A bit narrow through the hip but not uncomfortably so. I didn't end up wearing them at all. It's not flattering on wider hips. These were comfortable and pretty well fitted. They hit right above the navel and are a cute cropped length. 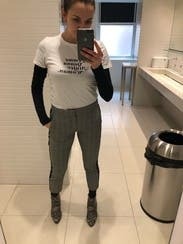 They were a fun way to spice up my work wardrobe and I got compliments on them! Super comfortable. Classic with a little modern flair with the stripe down the side. 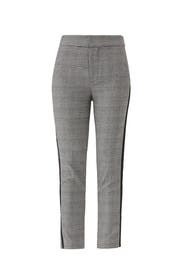 Loved these trousers, great for work. Classic look that stay on trend with the side leg stripes. Pockets pooch a little bit, but the rest is amazing. Fun stripe on side made this a bit more fun than the average pant. The pants were perfect for work. I love these pants! Great for work but still very comfortable. 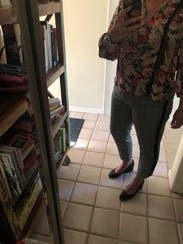 These pants are so comfortable but look very nice for work. The material they are made of is really great and I can tell they would last. They fit perfectly. 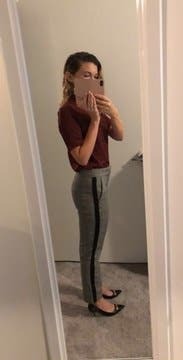 I am only 5'3" and pants are usually long on me, these worked great though. Love the style too, received many compliments. 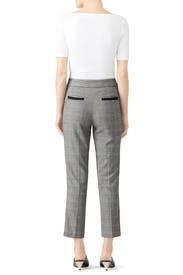 love the stripe down the side, adds flare to typical dress pants. These were a bit snug around my waist when I first put them on (I'm currently 150 lbs.) , but after wearing for a couple of hours they fit perfectly. I love the soft fabric at the style is really cute. 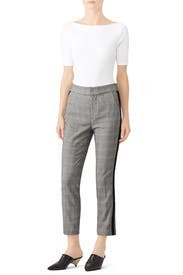 These are great for petite girls and fit more like an ankle pant than a crop on me (I'm 5'1"). Great with flats or heels, and would probably be cute with booties for cooler months.. These are great work pants with a bit of personality. The color matches a lot and the stripe gives it that extra fun. I almost bought these. These pants were a great go-to wardrobe addition. 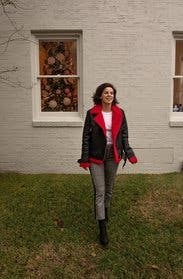 These pants looked nice, didn't wrinkle and worked great with tall boots, a sweater -- lots of different looks. I still don't understand why all the pants on RTR are so short though? *The clasp that RTR replaced at the waist before I received these wasn't the right size and did make the pants come undone. 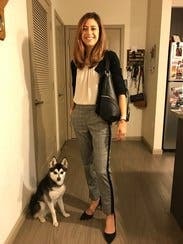 These pants are such a great style to wear everyday or to work. They're great for cold weather, light-weight, soft and keep the wind out!! The fit is great and comfortable.